I love finding out about new nail polish brands -- especially ones with a unique take on polish. So when I discovered Etoile on Twitter, I simply had to reach out to them immediately. You see, Etoile not only creates absolutely gorgeous colors, but they use actual diamond dust in the formula for a little added luxury to the everyday manicure. GENUINE DIAMONDS ON MY NAILS? You'd better believe I needed to check this brand out. I received the new Greenwich St. Soiree Collection -- two nail polishes inspired by NYC's West Village -- and was immediately smitten. Read on for swatches and my take on the colors. Fizzy Cucumber is a gorgeous mint green shot through with silver shimmer. Two coats covered the nail perfectly with no streaks or dragging. This is such a fabulous color for spring and summer -- I'm always on the hunt for pretty mint greens, and this one definitely fits the bill! I don't have anything else like it in my collection. Pink Panache is a vibrant hot pink with silver shimmer. Can't you just picture this on your toes while you're at the beach? Hot pink is THE nail polish color of summer to me, and this one in particular is so gorgeous and bright. Much like Fizzy Cucumber, two coats yielded even, perfect color. Both nail polishes went on easily and perfectly with two thin coats. I love the formula, especially with the hints of diamond dust. 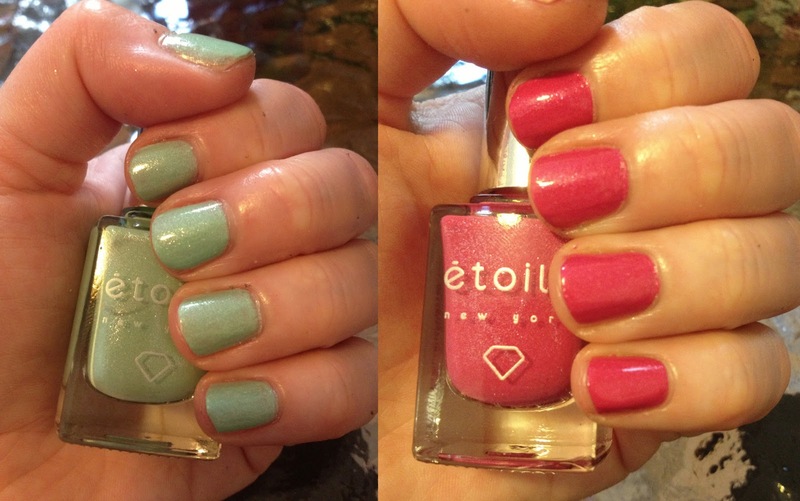 If you're looking to add a little luxury to your next manicure or pedicure, Etoile is definitely the way to go! Etoile nail polishes retail for $18 each. You can also purchase both nail polishes from the Greenwich St. Soiree Collection in the Greenwich St. Soiree Set for $26. Visit etoilepolish.com to see and purchase the entire nail polish collection.